Tadawul helps hundreds of students pass their CISI exams. Perfect 5-star ratings with every single Google review! That’s what we call student-focused learning. See what our students are saying on Google! Tadawul runs online classes for various CISI qualifications free of charge on our Youtube channel. Classes run from 9 pm to 10 pm UAE time every Monday, Tuesday and Wednesday. All you need is your laptop or mobile device to view the live classes. Join our next class by subscribing below. CISI qualifications offer practitioners the opportunity to achieve competence and foster strong careers in all areas of financial services. We cover all markets, from securities, derivatives, bonds, fund management, to stock trading and investing. Financial Statement Analysis, Valuation, Debt and Equity, Mergers, Acquisitions and Disposals, Regulations, Governance and Ethics. Our Wealth Management courses provide specialist knowledge to advise clients in local as well as global jurisdictions. Financial compliance, financial crime, governance and risk management, regulation and compliance. Structure and operation of the major foreign exchange and money markets as well as their core products: cash, forwards and derivatives. Our programmes cover Islamic Banking, Islamic Investing, and Islamic Insurance from both a technical and Sharia’a perspective. We will help you define what you require, and then tailor a specific innovative solution that truly fits your needs. Privately-held in-house CISI training, typically delivered across three to five days. Options available: face-to-face or live online. Tadawul offers 100% ROI to L&D managers. This means you no longer need to justify paying for candidates who fail! Tadawul is the official CISI training partner for retail and commercial banks, stock exchanges and brokerages, capital market regulators and financial advisors. CISI qualifications are now a regulatory requirement for job applicants in the financial services industry. Give your students the edge they need by combining your degrees with CISI qualifications. Tadawul partners with universities across the GCC to deliver CISI programmes to their students and clients. 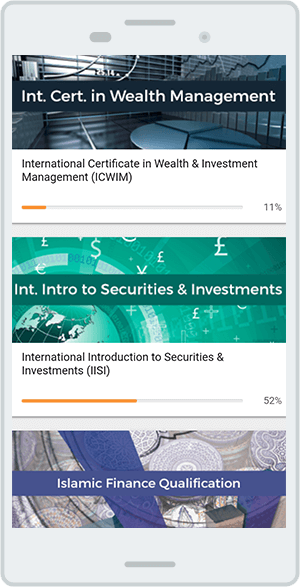 Available free of charge to all CISI students, the learning portal includes a massive library of exam prep materials, video lectures, downloadable notes and various trainer interactive modules that have proven to significantly help students pass their CISI exams. If you’re a student and you wish to gain access, please reach out by email [email protected] or WhatsApp +971562441942, and we’ll respond with a free username and password. Classic. Distraction-free. Face-to-face training fosters discussion and comradery among participants. Still most popular method in the region. Zero business disruption. Virtual learning is proving to be just as powerful as classroom learning, but more convenient and flexible. The most effective method of learning, the blended method combines the effectiveness of classrooms with the flexibility of online learning.